I was a precocious pre-pubescent child when I first encountered the word penetrate in a newspaper. It was not really a proper newspaper, I must confess. It was, more accurately, a rough pamphlet of a few pages with words typewritten in blue font. I still remember poring over the page where the word appeared, the paper worn and dog-eared from being read too many times. It confused me, the word. I did not understand what it meant. I found it intriguing that the adults had huddled together whilst reading the pamphlet, lingering on the page, and discussing its contents in hushed tones. I remember hearing the words Kudirat Abiola – the name of a woman I did not know – mentioned repeatedly in their sombre conversation. Growing up in Nigeria under the dictatorship of Sani Abacha in the 1990s, I thought it was perfectly normal that my country’s president was a military Head of State. It seemed perfectly normal that an imposing portrait of Abacha glowered at me – and hundreds of other pupils – every morning as we recited the national pledge in the assembly hall of our primary school. On one bright afternoon in Lagos, whilst returning from school with an aunt, we were stopped by soldiers with outstretched rifles who ordered all passers-by to file past them with their hands raised above their heads. I shuffled past the fierce soldiers with glee, mimetically lifting my arms to the skies, as though in surrender, just as I had seen the others do. And in callow excitement I wondered why such interesting incidents did not occur more often. Years later, I would discover that that pamphlet was one of several underground newspapers that flourished under the repressive Abacha regime. The article was a graphic account of the gruesome assassination of a pro-democracy activist. The assassin’s bullet – the pamphlet reported brusquely – had penetrated Kudirat Abiola’s skull. Nearly two decades after that tragic episode, the dark days of military rule have become a distant memory in the minds of many Nigerians. Just last March, former president Goodluck Jonathan suffered resounding defeat at the hands of retired Major General Muhammadu Buhari, his most formidable opponent in one of the keenest electoral contests in Nigerian history. The post-election mood is generally jubilant. Not many Nigerians will be sorry to see Jonathan go. Under his watch, the country laboured beneath the cruel weight of mindboggling corruption, massive unemployment, and the murderous Boko Haram insurgency in parts of the North, among several other woes. 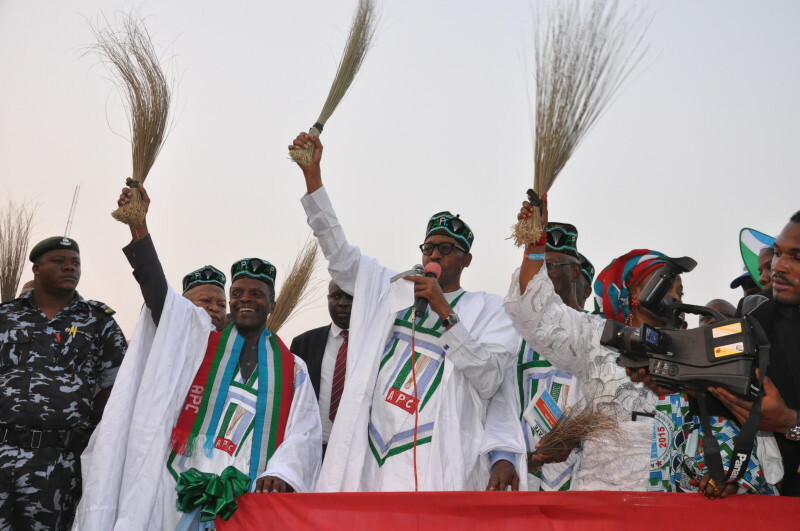 Buhari’s electoral victory on the platform of the All Progressives Congress (APC) marks a sharp decline in the fortunes of Jonathan’s hegemonic Peoples’ Democratic Party (PDP), the ruling party whose chieftains once boasted publicly of their intention to cling to power for at least 60 years. Apparently, the Nigerian electorate thought otherwise this time around. In a remarkably rare gesture – the first of its kind in Nigeria’s political history – Jonathan was quick to concede electoral defeat, congratulate Buhari, and reaffirm his promise to respect the will of the electorate thereby rekindling the hope of a peaceful political transition. And in May, Nigerians had good cause to celebrate sixteen years of unbroken democracy since the termination of military rule in 1999. In the March 2015 presidential polls, Nigerians expressed their disgust at graft, insecurity, and inept leadership even as they demonstrated their firm commitment to enhance the institutions of a nascent democracy. Hitherto, no incumbent president had ever lost an election in Nigeria. Pardon me. They might have lost had they bothered to count the votes. In an age when sit-tight leaders like Robert Mugabe and Yoweri Museveni still dot the African Continent, Nigerians have ample cause to celebrate the stupendous significance of their last presidential election. Yet, the irony of Buhari’s electoral victory is quite stark. Nigerians, after all, have just elected as president one of their former military rulers. As a former military Head of State, Buhari rose to power in December 1983 through a coup d’etat that ousted a civilian government and inaugurated an interregnum of successive military regimes. Surprisingly, however, many Nigerians are conciliatory in their assessments of his legacy. Wole Soyinka, the Nobel Laureate, who was himself both a fierce critic and victim of the country’s military regimes, urged the nation to tread the path of reconciliation in preparation for Buhari’s second coming. Grappling with the contradiction posed by his endorsement of a former military leader, Soyinka felt compelled to propound the curious concept of a born- again dictator. Buhari has himself repeatedly affirmed the existence of this new status, once describing himself as a “converted democrat” – in essence, a brand new man. The annals of history, however, are not as magnanimous. They chronicle the brutality of a particularly repressive time, marked by grave infringements of basic human rights. Not a few remember the economic hardship, press censorship, and despair of that period, as well as the enactment of draconian decrees that ousted the jurisdiction of the courts. During the rule of Buhari’s Supreme Military Council, respect for the rule of law waned even as retrospective criminal laws were promulgated. Fela Anikulapo-Kuti, the legendary Afro-Beat musician was only one of many political prisoners who were detained arbitrarily. At 72, his harshest critics dismiss him as a washed-out political has-been. And some Nigerians believe that Buhari, having occupied the helm of affairs – albeit for a brief period (1984-5) – shares, at the very least, some moral culpability for the country’s turbulent past. As they say, History will be cruel to those who forget. Is Buhari really born again? Should his sins, once red as scarlet, be seen as washed away? Should Nigerians regard the old things as having passed away and look expectantly instead for the new man? Judging from the results of the last elections, the majority of voters would appear to have answered these questions in the affirmative. Beyond his ipse dixit, however, Buhari has taken some steps to persuade Nigerians of the veracity of his claims. Since 2003, he has presented himself as a presidential candidate in three successive elections and endured resounding defeat each time thus demonstrating resilience and a new commitment to the democratic process. To his credit, Buhari is also widely perceived as something of a rarity: a disciplined and incorruptible figure who did not enrich himself through public office, unlike many elements of Nigeria’s notoriously rapacious political elite. Considering his military background, some pundits believe that he possesses the capacity to lead a successful onslaught against the barbarous Boko Haram sect. And in a bid to distance himself from perennial accusations of Islamic religious bigotry -Nigeria is almost evenly divided between Christianity and Islam – he even chose a prominent Christian evangelist as his running-mate in the 2011 presidential election. In his presidential inaugural address, he appeared to demonstrate a firm understanding of the challenges of his new position, even as he expressed his solid commitment towards restoring the country to a place of pride and uniting a sharply divided people in the aftermath of acrimonious electioneering. Every generation is entitled to define its relationship with the past and to shape the contours of its collective memory. This evocative task presents an opportunity to transcend the fractal cycles of a painful history and to navigate a society towards a meaningful future. Trailing my generation and emerging in the horizon is a new cohort of millennials who have no experiential notions of military rule. They are eager to place high hopes on the shoulders of Muhammadu Buhari – and those who come after him – as they lead the country into its latest democratic epoch. These ones will read in history books, as opposed to the underground press, of Kudirat Abiola, Bagauda Kaltho, Ken Saro-Wiwa and other martyrs of Nigeria’s burgeoning democracy. They will not be robbed of the innocence of childhood by the normalisation of tyranny or the standardisation of fear. A pertinent question, however, remains to be asked. How should the present generation of youths define their position within the context of a Buhari presidency? They cannot afford to forget, of course. History will be ruthless in condemning those who ignore its admonitions. They will do well to remember, however, that Buhari has ascended to power at a different time, in different circumstances, (on the strength of the ballot rather than through the barrel of a gun), and in a different place. They should insist on government under the authority of the supreme Constitution. They should ensure that he presides over a markedly different country characterised by an independent press and a vigilant civil society. They should insist that he share governmental powers with truly independent legislative and judicial institutions. Beyond a mere yearning for charismatic leadership, they must recognise the need to institutionalise the tenets of democratic governance. It is incumbent on them to demand a more liberal and inclusive society. History will be cruel to those who forget. As he settles into his high office, Buhari will come under the steady gaze of a youthful population animated by characteristic impatience and fiery political consciousness. He must realise that the time has come for action, not rhetoric. As the apposite Igbo epigram says: we do not expect a long sermon when we attend Evening Mass. He must act quickly for he will be watched with critical eyes. If he plays his part in rebuilding Nigeria’s broken walls and works assiduously to restore peace and prosperity to the land, he will have demonstrated sufficient gratitude to his compatriots for trusting him with the future, for the gift of a second chance. We hope that they will have cause to remember him – not with disgust as a recycled tyrant – but with fondness as Muhammadu Buhari: novus homo, the new man, He who was truly born again. An earlier version of this piece was presented to the Leadership Thematic Group of the 2015 Global Scholars Symposium (GSS) which took place at the Cambridge Union, University of Cambridge on the 21st-24th May 2015. Ugochukwu Ezeh is a lawyer.